Laboratory of Experimental Cancer Research, Ghent University, Belgium. Cancer Research Institute Ghent (CRIG), Ghent University, Belgium. Polymer Chemistry and Biomaterials Group, Department of Organic Chemistry Ghent, Belgium. Department of Basic Medical Science, Ghent University, Belgium. Department of Surgery, Ghent University hospital, Belgium. Unit of Molecular and Cellular Oncology, Inflammation Research Center, VIB, Ghent, Belgium. Peritoneal carcinomatosis is a major source of morbidity and mortality in patients with advanced abdominal neoplasms. Intraperitoneal chemotherapy is an area of intense interest given its efficacy in ovarian cancer. However, large peritoneal metastases (>0.5cm3) with adequate blood flow have high interstitial fluid pressure, which inhibits intratumoral drug distribution . To study drug penetration and its influencing factors, reliable in vivo models that mimic peritoneal carcinomatosis are crucial . By applying tissue engineering we successfully biomimicked a peritoneal ovarian tumor and its environment in mice. Functional blood vessel formation was evaluated with contrast enhanced µCT. A mixture of ovarian cancer cells and cancer associated fibroblasts was seeded on gelatin coated 3D PLA scaffold of 0.1 cm3 . After 3 weeks of in vitro culture, the tumor scaffolds (TS) and blank scaffolds (BS) were implanted on the inside of the peritoneal wall. Functional blood vessel formation was assessed with µCT. Four mice were IV injected with Exitron 12000 (Miltenyi Biotec). Contrast enhanced µCT imaging was performed on the X-CUBE cone beam µCT (MOLECUBES NV, Belgium). The high resolution protocol was used with the following acquisition parameters: one bed position (70×40 mm FOV), circular trajectory with four continuous rotations, 720 projections/rotation, 460 µA tube current and 50 kVp tube voltage, resulting in a four minutes acquisition time. Acquisitions were reconstructed into a 800x800x800 matrix with 50µm voxel size using the FDK algorithm . Quantification was performed by calculating vessel volume (mm3). Additionally, in vivo cell growth was longitudinally monitored using bioluminescent imaging. The tumor scaffolds cause only limited animal morbidity. Within four weeks the scaffolds were completely incorporated in the host mice. Functional blood vessels from the peritoneal wall enter the tumor scaffolds, visual on µCT . Quantification of the vessel volume showed more vessel formation in TS compared to BS . Additionally, it was demonstrated that the blood vessel volume is correlated with tumor cell growth within the scaffold. We can conclude that µCT imaging is a useful tool to assess vessel formation in TS. 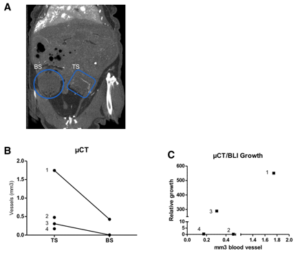 The TS become vascularized and show cancer cell growth proportional with vascularization as evidenced by contrast-enhanced µCT and bioluminescence monitoring, respectively. This model opens new opportunities for therapy evaluation of peritoneal carcinomatosis and its tumor environment. Sleightholm, R. et al. The American Society of Peritoneal Surface Malignancies Multi-Institution evaluation of 1,051 advanced ovarian cancer patients undergoing cytoreductive surgery and HIPEC: An introduction of the peritoneal surface disease severity score. J. Surg. Oncol. 114, 779–784 (2016). Gremonprez, F., Willaert, W. & Ceelen, W. Intraperitoneal chemotherapy (IPC) for peritoneal carcinomatosis: Review of animal models. J. Surg. Oncol. 109, 110–116 (2014). Jacobs, T. et al. Plasma surface modification of polylactic acid to promote interaction with fibroblasts. J. Mater. Sci. Mater. Med. 24, 469–478 (2013). Feldkamp L., Davis L., and Kress J. Practical cone-beam algorithm. J Opt Soc Am. A1, 612–619 (1984).